Viggo Mortensen senses a climactic, CG battle. I initially panned "The Lord of the Rings: The Fellowship Of The Ring" for various reasons (all, I still believe, are quite deserved), and it led me to dread returning to this intricate, but overblown fantasy realm that so many people hold in such high esteem. So here we are, a year later, and what a thrill it is to report that almost every element that I felt acted like cement shoes on "Fellowship" has either been abandoned, or at the very least, ignored in the latest chapter, "The Two Towers" (IMDb listing). The Fellowship of the Ring has been broken, with hobbits Frodo (Elijah Wood) and Sam (Sean Astin) continuing on their way to destroy the One Ring in the fiery pits of Mordor. Repeatedly lost and losing faith, the pair meets Gollum, a wicked, corrupted hobbit consumed with his quest to get the ring back. 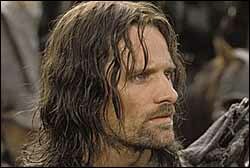 For Aragorn (Viggo Mortensen), elf Legolas (Orlando Bloom), and dwarf Gimli (John Rhys-Davies), their quest to save their kidnapped hobbit friends, Pippin (Billy Boyd), and Merry (Dominic Monaghan), has detoured, as the two have been taken into the forest in the care of the Ents, a race of walking, talking trees. Aragorn leads his team to the far-off land of the Rohan, a peace-loving people who have recently seen their king restored to power. When Aragorn learns of Saruman's (Christopher Lee) plan to unleash an army of Uruk Hais to take over Middle Earth, a battle commences at Helm's Deep, the hideout for the Rohan, that could change the balance of power in the quest for the ring. "The Two Towers" is a more personable, more beguiling moviegoing experience than "Fellowship of the Ring" for many reasons. For starters, the picture isn't hampered by the necessity of establishing elaborate character backstory and plot threads. It's free to hit the ground running, which gives the picture substantial energy. The crosscutting between the different story arcs also rewards the film, with less attention paid to Frodo and Sam's redundant subplot (they seem to accomplish nothing in this chapter), and most of the running time devoted to Aragorn, Gimli and Legolas, who clearly have the juiciest parts of the tale. Also, Tolkien's rich environmental subtext is more perceptibly explored in this film, with Jackson gladly drawing parallels between the Tolkien world and our own. Another significantly important improvement has been made to the picture's emotional core. I found "Fellowship" to be a cold fish, with only the fleeting romantic moments between Aragorn and Arwen (Liv Tyler) among the few virtues of the film. You cannot have a horde of special effects without providing any kind of emotional involvement, and Jackson seems to have recognized this in making "Two Towers." Along with a more in-depth investigation into the relationship between Aragorn and Arwen, there is the introduction of Eowyn (Miranda Otto, "Love Serenade"), who is developing feelings for the future king, making for a nice romantic triangle to come. The bond between the former Fellowship is also deepening, paying off in "The Two Towers" with exceptionally sweet and noble acts of friendship between the warriors, dwarves, elves and hobbits. This is exactly what the trilogy needs to survive, and I'm thrilled Jackson is allowing a little more sun to shine on this often dreary tale. Even with all the advances to the story and the density of the film, there are some nagging open sores that carry over from the first picture. Namely, the special effects. In the course of the year, Jackson seems to have become more confident in his special effects shots. "The Two Towers" features substantially fewer soaring, spiraling computer vistas (which still look like cruddy videogame interstitials), but a small handful remain. These shots always irritate me, as they scream artificiality, adding zilch to the scope or awe of the film. Jackson finds greater success in keeping the camera steady, allowing the effects to pass through the frame. I also enjoyed how many of the effects are presented in broad daylight, eschewing the muddy, hide-the-seams usefulness of keeping the visuals in the dark. Most of these new worlds and creatures (especially the Ents) look great, and with such confidence in presenting them this time around, "Two Towers" is more visually satisfying. Of course, when talking about special effects and "The Two Towers" (they do seem to go hand in hand), one cannot neglect the work done with the character Gollum. An emaciated, cracked hobbit, Gollum is a entirely CG character, much along the lines of (bad example) Jar Jar Binks in "The Phantom Menace," and more recently (good example), Dobby, in the "Harry Potter" sequel. Gollum represents the very state of art in animation rendering. He's a true feast for the eyes. Having said that, there's still an inconsistency in the animation, in that the character's facial features cannot compete (or keep up) with the gorgeous vocal performance provided by Andy Serkis ("24 Hour Party People"). Gollum remains a mysteriously empathic, yet ghastly figure, but also embodies a continued excellence in pursuing richly detailed CG characters. For the first time in this series I've felt the glee, the wanderlust, and the wonderment of Tolkien's story and Jackson's interpretation. How long will this last? I guess I'll find out next December with "The Return of the King." But until then, I can say with sincerity that I genuinely enjoyed at least a third of this rapidly expanding trilogy.